Enjoying our living space to its maximum potential is natural to San Diegans. Our seasoned architects are familiar with the various micro-climates throughout the area. We develop designs using eco-friendly materials suitable for your particular area. Our exterior designs flow seamlessly from the home’s interior, accentuating the property’s beauty while conserving natural resources. If you are considering new landscaping, including a hardscape element, let us develop a design appropriate for your micro-climate. We have developed relationships with local suppliers who provide only the finest quality materials for our designs. 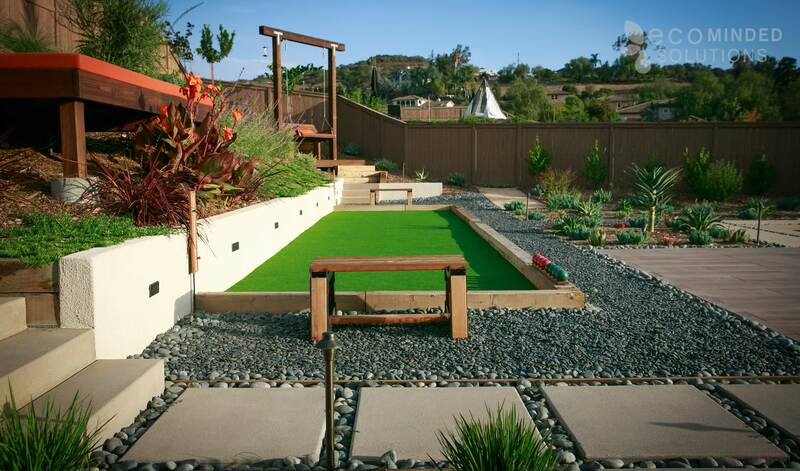 Our creative landscape designs can feature a wide range of materials. We consult on your likes and dislikes, then our design architects compile the best options to create an environmentally conscious home that showcases your personal taste and lifestyle. You are probably already using concrete in your garage floor, driveway, and, perhaps, your sidewalk. For continuity, you may wish to incorporate other concrete constructions, polished or plain, in your new landscape. Woods are a popular choice for decks and other landscape components, but don’t rule out faux woods immediately. They are constructed to be tougher and longer lasting than natural wood. If you enjoy occasional new projects, wood may be the right choice. If you’re a fix-it-and-forget-it property owner, consider faux-wood. Bricks deliver a traditional elegance that many people love in their gardens. Bricks can be laid in a variety of designs and combine well with other materials. Since we live in hot, dry Southern California, bricks last longer here and are a wonderful design element. The distinctive beauty of tiles often appeals to discerning homeowners. However, tiles do require more care than other hardscape materials. Pavers and natural stone are available in attractive colors. Large slabs of granite, marble, or limestone add timeless elegance and opulence. Pavers are created to withstand traffic, so they are more durable than many other hardscape materials. Loose stone is most often used in driveways or walkways but can be extremely versatile when employed by our creative architects. Whether your lawn is small or consists of acres you wish to transform into a private, sustainable parkland, the experienced professionals of Eco Minded Solutions are eager to design and construct your project. We create high-quality, custom homes and lawns, luxurious outdoor spaces, and complete renovations of existing homes and landscapes. We serve clients throughout the San Diego area, including La Jolla, Encinitas, and Del Mar. Our experienced staff can advise if your dream landscape will fit your space and create a design that will display your home to its greatest advantage. The plants and other products are selected to conserve water. Each of our completed projects is of outstanding quality and uses natural resources wisely. Contact us online to schedule an initial consultation for your hardscape project in the San Diego area!